Don’t get between a shopper and their traditional printed flyers. That’s what a study released in November 2014 found when 97% of those surveyed said they rely on flyers to make purchasing decisions. And many of them – 86% – take the time to read their flyers on a weekly basis. The study, commissioned by Metroland Media, a publisher of community newspapers and flyers, also found that while marketers feel the pressure to move to digital advertising and online flyers, they should think twice. Particularly if you are a grocery, mass merchant or drug store. For consumers seeking information on sales in these types of stores, print flyers are considered more valuable than online or email by a significant margin. The survey found that print flyers remained a top source for identifying sales, and finding new products. Consumers looked to print flyer advertising more than store websites to research product information and deals (3.3 times more); when comparing price and value (twice as much); while researching the range of products available (1.6 times more) and when researching which store carries a product (1.6 times more). “In a digital world where information flows freely on multiple screens, you’d think print flyers would be less important to consumers, but this study finds the exact opposite,” Metroland Media President, Ian Oliver, said in an interview. “Shoppers became quite emotional when we asked them how they use flyers. And as it turns out, flyers continue to play a significant role in how we decide what we want to purchase,” he added. Flyers, it turns out, are an important part of a retailer’s integrated marketing strategy. By using a number of different media platforms, including print, companies find different ways not only to reach consumers, but also to have them interact with a website or store. In fact, 71% of consumers surveyed say they are more likely to visit a retailer that sends them flyers. Additionally, 72% say that flyers impact their purchase decisions, and more than half say that flyers are a valuable part of their life. 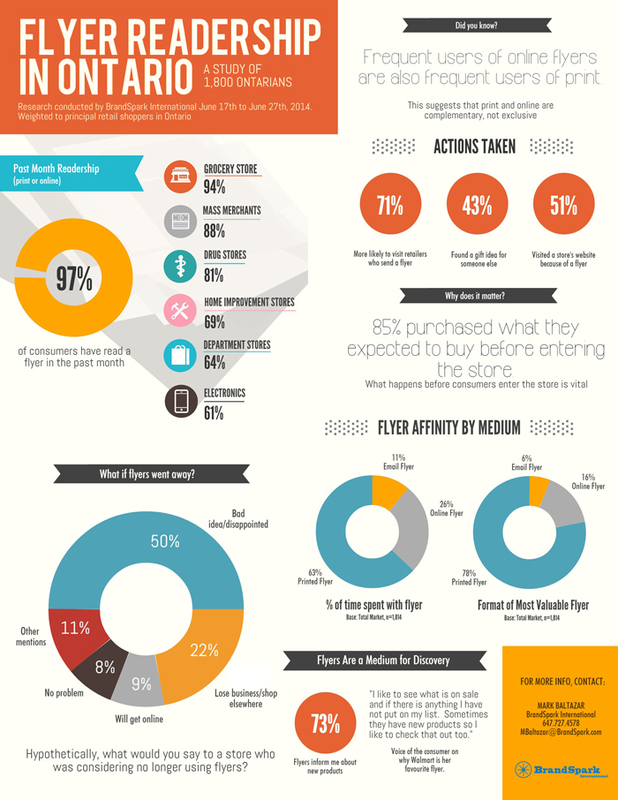 More than half (51%) have visited a store’s website after reading a flyer. BrandSpark surveyed 1,814 retail shoppers living in Ontario, Canada between June 17th and June 27th, 2014. Calculated scores have a margin of error of ±2.3%, 19 times out of 20.